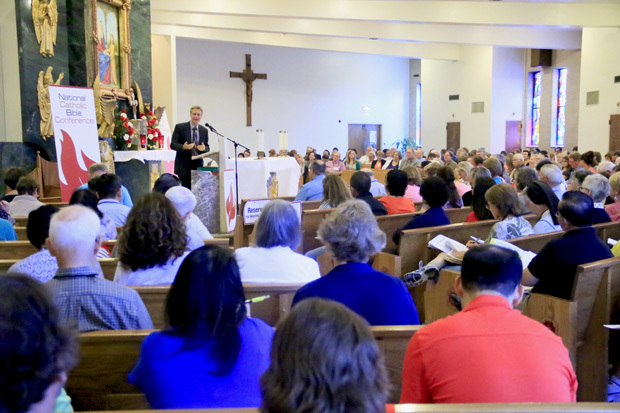 “Scripture and the Family of God” was the theme for National Catholic Bible Conference 2015 (NCBC) held at the Shrine of Our Lady of Czestochowa in Doylestown, June 19-20. It certainly fits in with the upcoming World Meeting of Families, which will be held in Philadelphia Sept. 22-25 and immediately followed by a two-day visit by Pope Francis. 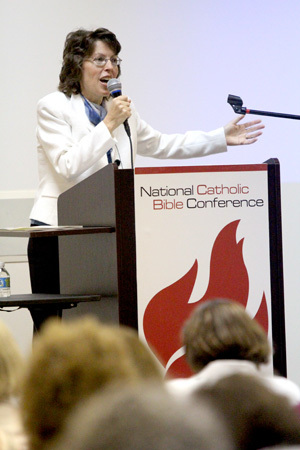 The Bible conference, which is in its 11th year and third at Our Lady of Czestochowa, was sponsored by the Great Adventure Catholic Bible Study Program, published by West Chester-based Ascension Press. It attracted more than 1,000 lay people, sisters, deacons and priests, with many of them teachers in Bible programs. Two of the speakers were Jeff Cavins, developer of the Great Adventure program and Sarah Christmyer, the editor of the series. Cavins is also the director of evangelization for the Archdiocese of St. Paul-Minneapolis. “God loves us not because we deserve his love, but because it is his nature to love,” Cavins told his audience, adding it is the duty of parents and grandparents to pass this on to their children. Interestingly, as he has explained in books and interviews, Cavins does not owe his strong faith to his parents. They were Catholic and loving, but they did not speak about religion at home. “I never understood the difference between affectionate love and God’s unconditional love,” he said. It was not until college when through a fellow student, Emily Tobler, who was not Catholic but was a committed Christian, that he began to really understand the love of God. The two would later marry. Cavins left the Catholic Church and ultimately became a minster, but after about 10 years, his further studies convinced him of the truth of the Catholic faith. He rejoined Catholicism and Emily also entered the faith. The parents of three daughters, Jeff and Emily Cavins are both prolific writers and popular speakers on Catholic Christian topics. 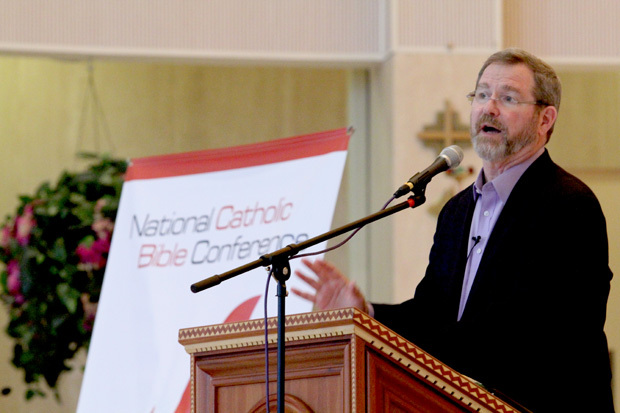 The first keynote for the conference was given by Thomas Smith, who served as the director of the Denver Catholic Biblical School and the Denver Catechetical School, who spoke on Pope Francis’ letter, Evangelii Gaudium (The Joy of the Gospel) and its reminder of Christians’ baptismal call to be missionaries. Other speakers at the conference were Dr. John Bergsma, an associate professor of theology at Franciscan University; Dr. Mary Healy, an associate professor of Sacred Scripture at Sacred Heart Major Seminary, Detroit and Dr. Edward Sri, provost and professor of theology and Scripture at the Augustine Institute in Denver. 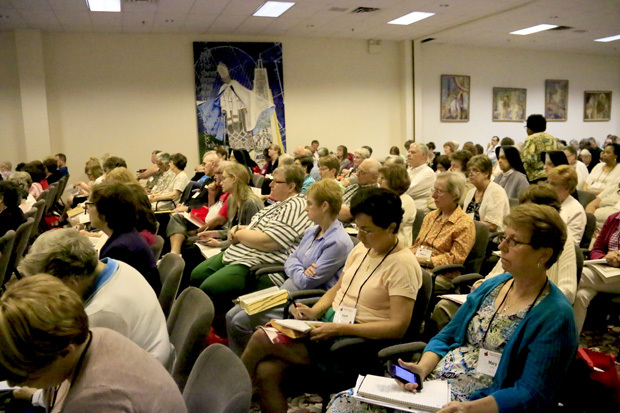 While most of those attending the conference were from up and down the East Coast, as one might expect a number were from the Philadelphia Archdiocese. Dot Reilly, who teaches Bible studies at Our Lady of Ransom Parish in Northeast Philadelphia, has read the writings of several of the speakers but enjoyed the chance to hear them too. “I come for my own enrichment so that I can pass it on,” she said. Deacon Bill Bradley, who is director of the archdiocesan Office for Black Catholics, noted that the St. Martin de Porres Foundation provided scholarships for representatives of predominantly African American parishes. “This is a wonderful conference with great speakers to enlighten us about the truth of the Bible and how it applies to everyday life,” he said. Janice Mason, who was part of the group from St. Raymond of Penafort Parish in Philadelphia, said she was a cradle Catholic but as a child after Mass she would go on to a Baptist Church where her grandmother sang in the choir. “I’m a Bible-loving Catholic,” she said. But of course not everyone was local. Theresa Howe came down from St. Lawrence O’Toole Parish in Brewster, Putnam County, New York, and thought it well worth the trip. “I’m a Bible study leader, and I really enjoy listening to all these wonderful speakers,” she said.